On a day commemorating what would have been Martin Luther King Jr.’s 86th birthday, blacks and whites in the United States in many ways continue to live starkly different lives. African Americans are less financially secure than whites, less likely to have ever been married, and less likely to own their own homes. More than six decades after Brown v. Board of Education, more than three-quarters of black public-school students attend majority-minority schools. 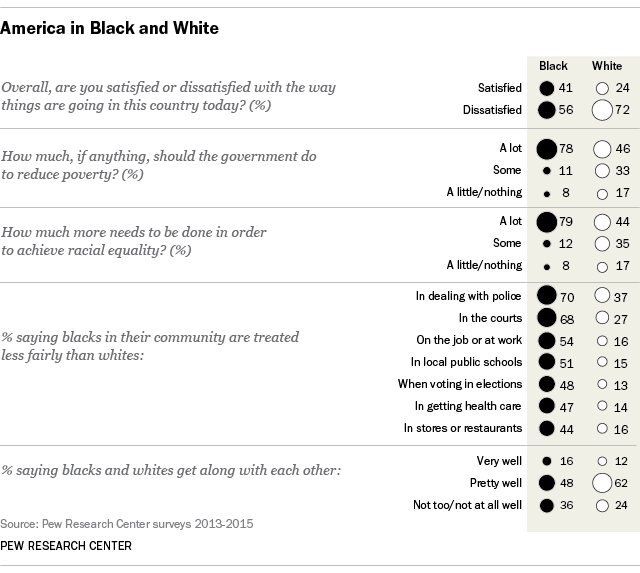 Yet blacks express a higher degree of satisfaction with current conditions in the U.S. (though that likely reflects partisan differences as much as anything). Small wonder that blacks and whites often see the world very differently. We’ve gathered some key findings from recent Pew Research Center reports on black-white perception gaps. On this Martin Luther King Day holiday, it makes for sobering reading.